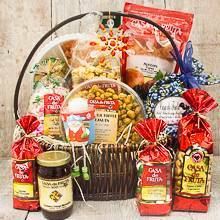 Give your family, friends, clients, co-workers, and employees something to cheer about with this deluxe Christmas gift basket. Christmas Holland Mints 8 oz. Yogurt Christmas Pretzels 5 oz. Wild Huckleberry Muffin Mix 16 oz. Net Wt. 106 oz. Ship Wt. 10 lb.